The Christmas on the Trail Chuckwagon Dinner Show located at the Shepherd of the Hills Historic Homestead & Old Mill Theatre in Branson is a wonderful Christmas Dinner Show that everyone is craving about. This Christmas dinner show in Branson can be enjoyed along with the Trail of Lights tour and an inspiring tour to the top of the Inspiration Tower. But before enjoying both the fascinating tours, you’ll be treated first with a hearty and sumptuous Christmas dinner that will leave you absolutely satisfied. After the elegant Christmas Dinner, you’ll gather around the cozy campfire scene onstage on backdrop of festive, live evergreen trees as the singing group sings to the tune of all your favorite Christmas carols that remind everyone in rediscovering the true meaning of the holiday season. 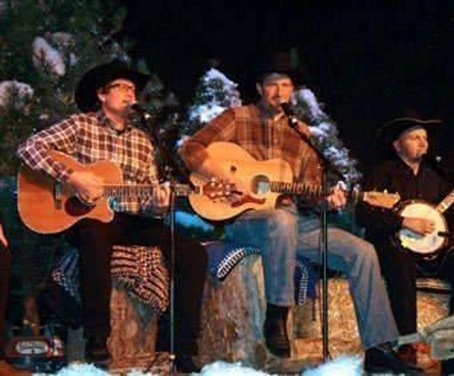 You will be hearing familiar music with a country western twang as the traditional old time Christmas is celebrated. Before joining the Trail of Lights tour, you’ll make a stop at Santa’s magical Christmas wonderland where you see children sit on Santa’s knee telling him what they want for Christmas. After spending a great moment with Santa, it’s time to light up your day with a two and a half mile journey down The Trail of Lights, where you see incredible and decade long of Christmas traditional display of lights and great music. During this exciting drive-through holiday adventure, you’ll be seeing millions of Christmas lights, as well as themed, animated scenes with figures in cozy cottages and home villages. From here, you’ll find your way through the 160-acre Shepherd of the Hills Homestead and you can get the chance to enjoy a special family Christmas gathering with many other tour participants. To enjoy a wholesome fun on this heartwarming night, you will be served with complimentary cup of coffee, hot chocolate, or spiced cider to warm your belly before you take the next tour. As you step into a glass elevator, it will rise 230 feet up to the top of the Inspiration Tower, where everybody can experience Santa’s-eye view of the Trail of Lights and the spectacular view of Branson at night. After enjoying ‘Branson’s biggest and best Christmas adventure’, everyone on the Christmas on the Trail Chuckwagon Dinner Show, both young and old alike will surely experience an unforgettable moment during the fascinating tours. This Christmas dinner show in Branson is nothing like celebrating in such an old-fashioned way. For visitors who’d like to participate than simply enjoy the scene, you can join in singing carols. In this event, you’ll experience like sharing the holiday with a big, extended family with a hearty chuckwagon meal, enjoying music around the campfire, and an elevator ride up to the top of the Inspiration Tower and enjoy the picturesque view of Branson at night. For a touch of old-fashioned Christmas celebration in Branson, you’ll be hearing familiar holiday music and some favorite Christmas carols that remind everyone in rediscovering the true meaning of the holiday season.